At the door of the cathedral, the icon was greeted by the Right Reverend Bishop Matthew of Sourozh and the clergy of the Cathedral. Straight after the arrival of the icon, a moleben with an akathist to the Most Holy Mother of God was served . 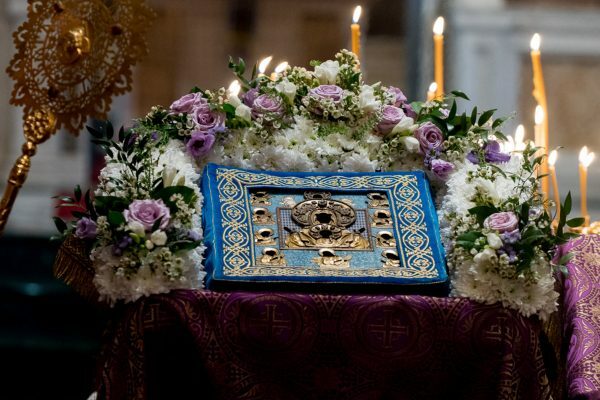 Numerous parishioners of the Cathedral and pilgrims, who arrived from various cities of the Great Britain, venerated the Protectress of the Russian Diaspora, one of the main holy objects of the Orthodox world. Immediately after the moleben, an all-night vigil was served, headed by His Grace Vladyka Matthew. 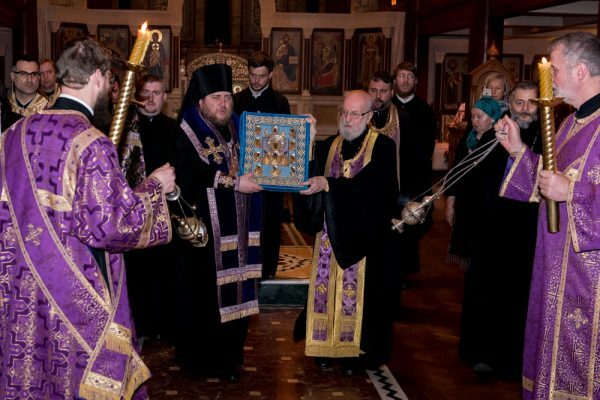 During the Matins of the vigil, after the great doxology, the Holy and Life-Giving Cross of the Lord was brought from the altar to the middle of the Cathedral for the rite of veneration. At the conclusion of the all-night vigil, before the departure of the icon, His Grace, together with the clergy, served a short prayer service in front of the miraculous icon.